warning: LF will be replaced by CRLF. Is this warning tail backward? And git changes it to LF for committing to repo. warning: CRLF will be replaced by LF. That way, you avoid any automatic transformation, and can still specify them through a .gitattributes file and core.eol directives. windows git "LF will be replaced by CRLF"
Use this setting if you want to have CRLF line endings in your working directory even though the repository does not have normalized line endings. As described in "git replacing LF with CRLF", it should only occur on checkout (not commit), with core.autocrlf=true. I still feel this message is confusing, the message could be extended to include a better explanation of the issue, for example: "LF will be replaced by CRLF in file.json after removing the file and checking it out again". Note: Git 2.19 (Sept 2018), when using core.autocrlf, the bogus "LF will be replaced by CRLF" warning is now suppressed. As quaylar rightly comments, if there is a conversion on commit, it is to LF only. warning("LF will be replaced by CRLF in %s. It is called by convert.c#crlf_to_git(), itself called by convert.c#convert_to_git(), itself called by convert.c#renormalize_buffer(). And that last renormalize_buffer() is only called by merge-recursive.c#blob_unchanged(). So I suspect this conversion happens on a git commit only if said commit is part of a merge process. Note: with Git 2.17 (Q2 2018), a code cleanup adds some explanation. See commit 8462ff4 (13 Jan 2018) by Torsten Bögershausen (tboegi). When calling convert_to_git(), the checksafe parameter defined what should happen if the EOL conversion (CRLF --> LF --> CRLF) does not roundtrip cleanly. In addition, it also defined if line endings should be renormalized (CRLF --> LF) or kept as they are. Note that a regression introduced in 8462ff4 ("convert_to_git(): safe_crlf/checksafe becomes int conv_flags", 2018-01-13, Git 2.17.0) back in Git 2.17 cycle caused autocrlf rewrites to produce a warning message despite setting safecrlf=false. See commit 6cb0912 (04 Jun 2018) by Anthony Sottile (asottile). YES the warning is backwards. And in fact it shouldn't even be a warning in the first place. 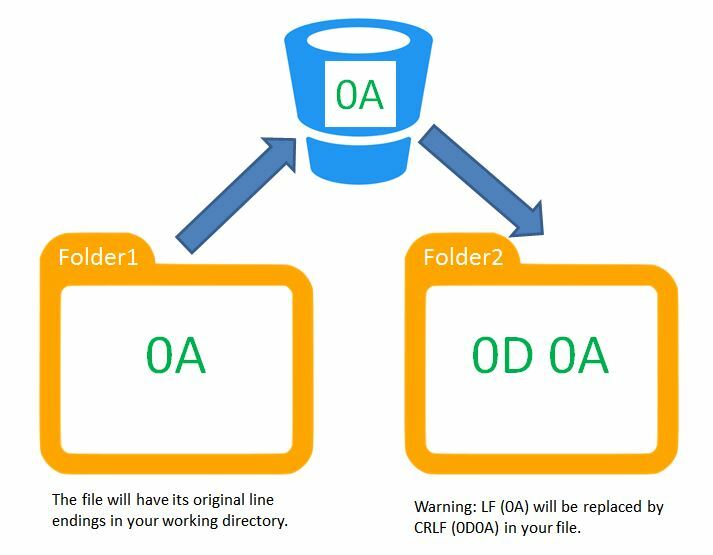 Because all this warning is saying (but backwards unfortunately) is that the CRLF characters in your file with Windows line endings will be replaced with LF's on commit. Which means it's normalized to the same line endings used by *nix and MacOS. Nothing strange is going on, this is exactly the behavior you would normally want. NO. It is correct and accurate. It is NOT talking about your files currently with CRLF. It is instead talking about files with LF. git config --global core.autocrlf false works well for global settings. After I set core.autocrlf=true I was getting "LF will be replaced by CRLF" (note not "CRLF will be replaced by LF") when I was git adding (or perhaps it was it on git commit?) edited files in windows on a repository (that does use LF) that was checked out before I set core.autocrlf=true. I made a new checkout with core.autocrlf=true and now I'm not getting those messages. What is the best git config set up when you are using Linux and Windows?